Recently a friend shared stories with me of growing up with two grandmothers: Big Granny and Little Granny. I found these stories quite poignant. How lucky he is to have had these two wise women loving him into a fine person! And how lucky were his parents to have had extended family to help with the nurturing of their little birds. The extended family, common in Mennonite culture, is becoming rare in the nuclear-family-is-all Americana of today. This was sent to me from a dear friend, who thought it might resonate. It certainly did, with memories of both Big Grandma and Little Grandma. I had to laugh at the dusting reference, and cry at the overall memory of what amazing, hardworking, capable and loving women they were—all stirred by a simple piece of cloth. I don’t think our kids know what an apron is. The principal use of Grandma’s apron was to protect the dress underneath, because she only had a few, it was easier to wash aprons than dresses and they used less material, but along with that, it served as a potholder for removing hot pans from the oven. It was wonderful for dusting, drying children’s tears, and on occasion was even used for cleaning out dirty ears. My own grandma came from the old country at a very advanced age, having survived the Armenian Genocide. She did not speak English. She probably wore an apron, but I don’t remember.What I remember are the black clothes she wore, head to toe and the sadness she carried about her. 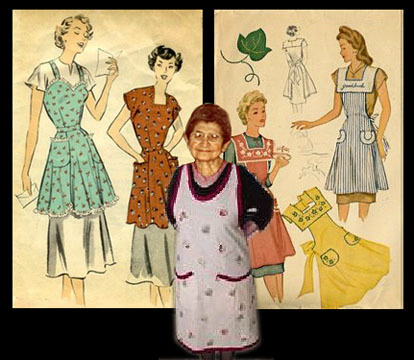 However, my mother wore aprons, big-time…it was the 1950’s and aprons were still a practical piece of clothing for older women like my mother. I remember her nagging me to “put on an apron,” but I was headed for the 60’s and 70’s. By then aprons were getting smaller and smaller until by the 80’s they disappeared into jeans and sweat pants. Do I wear one now that I am o-l-d? No, I’m still doing the 80’s thing and wiping my hands on the side of my pants leg! Here’s a little composite I made for you in honor of aprons…the face on the chubby lady in the center is my mother. The chubby body is not. Ah, the miracle of Photoshop! I do have one of grandma’s aprons that she embroidered in 1915 (as is embroidered next to the flowers). Sure, I’ve also been known to wipe my hands on the side of my jeans but there are occasions when I prefer to wear an apron…such as preparing a meal for guests and I don’t want to mess up my guest-worthy duds; or when frying tortillas for tacos and don’t want grease spattered on even my old sweats. My favorite apron is a bib-style that I made for my mother years ago while living at RPF…we were poor and made gifts for Christmas and birthdays. It has a whole row of pockets in the skirt – very practical. I don’t know if she ever wore it but I found it after she died and brought it home (along with a few other things of hers that I treasure). Obviously the cotton fabrics of yore were sturdy because it is still in very good shape. Perhaps you’ve even seen me wear it when you were in a guest in my home?